Here it is, “Moth Monday,” and one species rises to the top of the priority list because it is experiencing a real population boom here on the Front Range in Colorado. 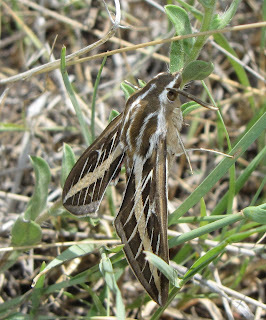 The White-lined Sphinx, Hyles lineata, is common across most of North America, but in both the adult and larval stage it can make headlines and baffle the average citizen. 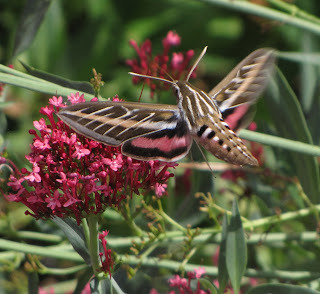 Several species in the family Sphingidae go by the informal name of “hummingbird moth” because they approach or exceed the size of hummingbirds (wingspan 6.3-9 centimeters), and are frequently seen hovering in front of flowers like their namesake feathered friends. At first glance, many people believe they are indeed seeing a hummingbird. Then that long proboscis comes into focus. Out comes the smart phone or camera, and several Facebook posts later the person may finally get a proper identification. The adult moth can be active at almost any time of day or night, and visit a wide variety of flowers for the nectar they use to fuel their rapid, energetic flight. Below is a video I made of one of two specimens I saw in a butterfly garden in downtown Colorado Springs on August 30, 2013. I subsequently saw several more visiting an ornamental butterfly bush (Buddleja or Buddleia sp.) across the street from our townhouse….but they are everywhere right now, profiting from summer rains that made larval food plants available by the bushel. It is the caterpillar stage that often causes people consternation. They superficially resemble the tomato hornworm, but are more conspicuous and often more numerous. 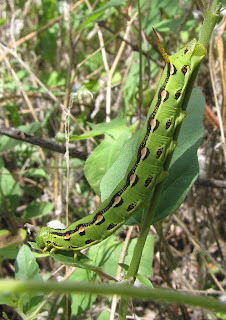 The image below depicts the typical appearance, but the larvae can be yellow, or mostly black, with much variation in between. The caterpillars are general feeders on a variety of plants, shrubs, and trees, but seem partial to those in the evening primrose family. Oenothera primrose plants are not terribly substantial, so it takes more than one plant for a caterpillar to mature. The larva simply finishes off one plant and walks on to another. When there are lots of caterpillars (one female moth can lay up to 500 eggs), food plants can quickly become scarce as they are consumed, and the caterpillars are forced to “march” in search of literally greener pastures. These large scale “migrations” may cross rural roads creating a slick hazard as they are crushed under tires. Once finished feeding, the caterpillar again begins walking in search of a place to pupate. Each larva burrows into the soil and creates a chamber several inches underground. There it molts into the pupa stage. This is how the species overwinters, though there is usually more than one generation per year, especially under favorable conditions. The White-lined Sphinx also ranges south to Argentina. A very similar species, Hyles livornica occurs in Eurasia and Africa, and may account for persistent claims that H. lineata is found in the Old World. Look for the adult moths at dusk and dawn, for they are mostly crepuscular in their activities. Still, they may show up at your porch light after dark as well. By day they usually hide among tangled grasses where the moth’s pattern of lines serves it well as camouflage. This is an animal of open habitats, so they are most abundant in prairies, deserts, agricultural lands, vacant lots, and gardens. In the western U.S., the White-lined Sphinx is a resident species only from southern California to west Texas. It immigrates annually farther north. Rarely is this moth a pest, though the caterpillars occasionally do damage to grapes and tomatoes in Utah. 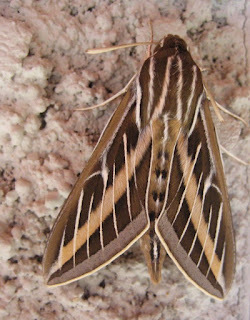 Hyles lineata, as prolific as it is, is not without enemies. Pallid bats and large mantids eat the adult moths. Tachinid flies in the genera Belvosia, Drino, Winthemia, and Compsilura among others, are internal parasites of the caterpillars. Certainly ichneumon wasps and braconid wasps are also parasites. Sources: Arnaud, Paul Henry. 1978. Host Parasite Catalog of North American Tachinidae (Diptera). Washington, DC: U.S. Department of Agriculture, Miscellaneous Publication No. 1319. 860 pp. Oehlke, Bill. 2001. Sphingidae of the Americas. Opler, Paul A., Kelly Lotts, and Thomas Naberhaus (Coordinators). 2013. Butterflies and Moths of North America. The first one I've ever seen showed up recently just as you described - on the back porch attracted by the porch light. I thought it was gorgeous and was surprised by its size. Thanks for writing about this it - I did not know it was a "hummingbird" moth. You're welcome, Lisa! 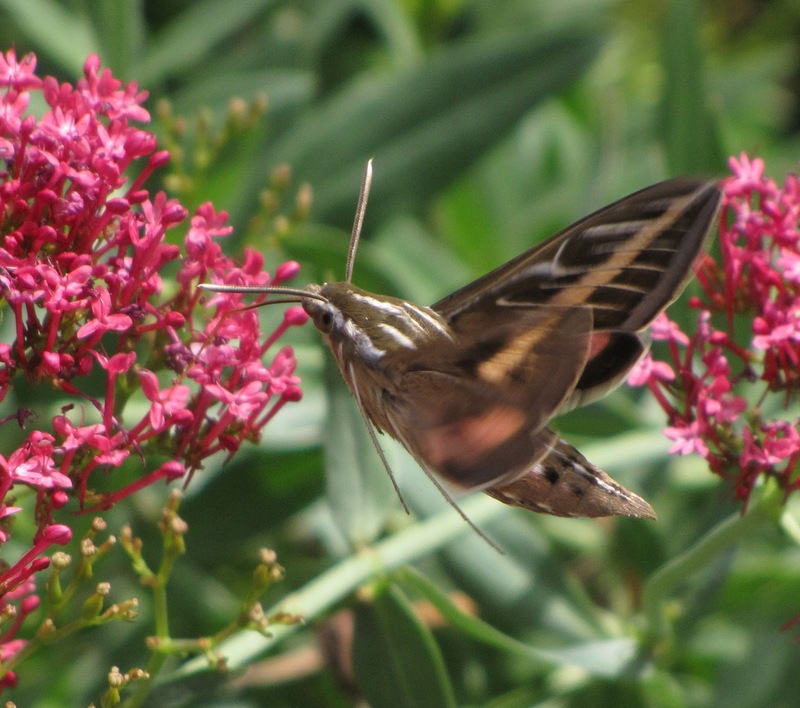 "Hummingbird moth" is widely applied to several species in the family Sphingidae, and is the official common name of Hemaris thysbe, a type of diurnal sphinx with clear wings. I hope to photograph one of those at some point, too. I'm terrified of them. It's April 3rd and I saw 3 in 24 hours. 2 came into my house (the door was open). Is there anyway to keep them away? Like incense or citronella, or something? Well-versed: I don't know if you are talking about the moth or the caterpillar. You could start by closing the door, though. You may also want to decide whether you have full-blown entomophobia (fear of insects) that interferes with your daily activities. I am not being dismissive or sarcastic, but sincerely trying to help. well-versed, Please send these beautiful moths to our house! Remember, humans are usually fearful of things we do not understand. Lovely & benign, these lovely creatures service a definite purpose in "our" world. You should research on-line, or purchase a book on moths & butterflies. I'm in southeast Iowa and have been watching a couple of these moths feeding on hibiscus flowers growing by my front door. I first noticed them about mid-morning and it's now almost noon. After doing a search online to find their identity, I grabbed my camera and went back outside, but they were gone! It's very hot and dry here, and they disappeared the moment it became overcast and we received a very light sprinkling of rain. They're not fond of moisture or what? I coulda had the most spectacular shot!! I now remember these "hummingbird moths" were numerous last year in our local Wal-Mart's garden center when I was there in the early evening. They are a lovely added attraction to a flower display. And appreciate your blog; thanks for sharing your expertise! I run a before and after school program in Eastern Nebraska. We ran across one of these caterpillars on our playground this afternoon. We caught it and currently have it in a jar (with holes of course:) ). We'd like to watch its life cycle. How do we keep it alive? Sara: The caterpillars dig into the soil to become pupae, so your container needs to have at least 6 inches of fairly dense-packed soil in the bottom. You can try feeding it one of the plants mentioned above or in the links and references cited, just in case it is not done eating. Do expose the container to natural cycles of day and night, for that is more important than temperature in keeping the pupa from hatching early. The garage window might be a good place. Good luck. I live in Otay near the Mexico/California border and have found two in the last month on my silver car. The first I had ever seen hung on for about 10 miles until I took it off and set it on a ficus tree at our destination. It never moved its wings but did walk onto a stick. The second was just two days ago and it flapped its wings rapidly but never flew away as I set it on a bush in front of my house. Were these probably dying? Not sure. Could be just the opposite: recently emerged and not yet able to fly strongly. I live at 7800 feet in the San Juan Mountains, just north of Durango, CO. I have one of these in my house right now. I'd thought it might be a modest sphinx moth, since those are supposed to be more common at higher elevations and feed on aspen, cottonwoods, and willows, which are all in my yard (http://www.ext.colostate.edu/pubs/insect/05517.html). But when it stopped buzzing around it was clearly a white-lined hummingbird moth. Hi, Suzie. There are a great many of these moths around Colorado Springs right now, too. I'm sure there are at least two generations per year here. I found a six lined sphinx moth larva at work the other day and brought it home. It is getting ready to pupate, and I'm wondering if it is going to hatch out as an adult this summer or if it's going to over winter? What do you think? Samantha, I don't know what a "Six-lined Sphinx" moth is, but many species have more than one generation per year here in the U.S. So, my guess is that it will emerge from its pupa later this summer. I found a six lined sphinx moth larva at work the other day and brought it home. It's getting ready to pupate, and I was wondering if it's going to hatch out this summer or if it's going to over winter? What do you think? I live in the chicago area if that helps. I'm a teacher and I have numerous animals in my classroom from snakes to a lizard, tree frog, tarantula, as well as a common funnel weaver spider, mantis, beetles, centipede.... I found one of these caterpillars and am thinking it would be great to show the kids the life cycle up close and keep it to pupate, hatch, then release it. How difficult would that be? What set up would I need, and what food to feed the caterpillar. I know primrose, but not sure how easy that is to come by. Any info and help or advice would be appreciated! Mike, I do not rear moths, but there are plenty of people who do, some of whom have websites with the instructions you are looking for. I'd search for "rearing Hyles lineata" and see what comes up. Good luck! we had one show up on the window of my shed overlooking my garden it stayed there for almost 2 days then it was gone.then a few days later another one showed up or it could have been the same one showed up on my bug light and stayed there for 2 days.scott in keizer,oregon. I was delighted to see one yesterday, on the very first day of my new school in Delray Beach, Florida. Not knowing that hummingbird moths exist, I assumed that I was greeted by an unusual hummingbird. Are they usually found in S Florida? Thanks for you terrific site. Thank you for the compliment. Yes, this species is found across the entire continent....but you have some unusual, similar species there in Florida. Sphinx moths in general are more diverse in the tropics. 2 days ago started the migration here in Arizona there are caterpillars everywhere! I have 4 in a container with plenty of soil hoping to see what happens! I have a white lined sphinx moth pupated, and hatched but I'm worried that if I release it in the winter it will die. I live in central PA and though it has been fairly mild so far this year I don't want to see the creature die. Please advise with what to do and thanks. First of all, I appreciate very much your concern, and understand your dilemma. As I see it, the insect will die one way or another (in captivity or out in the wild). I would set it free such that it will at least enjoy its days in sunshine and a natural setting. Just my opinion, of course. You might want to plant a "pollinator garden" next spring to attract more moths and other insects that you can enjoy, too. I saw one today at a garden centre in Ottawa, Ontario. I have never seen one before. Magical! I have seven and im wondering how big will they get when they are ready to go in the ground? Big. Like size of a finger big; but, refusing food is a better key to when they are looking to pupate. They will be wandering, even when there is fresh food available. I took a picture of one today "hiding" on a large Cactus Zinna stem in my garden here on the Eastern Shore, Salisbury MD. I have a photo, but don't see how to post it here. This is a blog, not a photo-sharing site....but there *are* photo-sharing pages like Flickr, which I use myself. There is also Facebook, Instagram, and other social media outlets. I am pretty sure Facebook even has a group devoted to Maryland insects, or at least wildlife. Hello! I found the larva in the parking lot at work. I work with children and he/she has become known as Francis. Francis just started their pupa yesterday, any idea when I should put the butterfly net up over the cage? We will be releasing as soon as they make their debut! Not knowing where you are located, it could be 10 days....or next spring, when the adult moth emerges from its pupa. Hi Bug Eric. I want to say "thank you" for your very good, informative website and your thoughtful and patient responses to all questions. I winter in the Coachella Valley and summer in western Canada, so keeping track of all the thousand of plants and animals requires websites like yours. We saw a hummingbird moth this evening in the frontyard feeding on the blooming jasmin - in the middle of West Hollywood. So fascinating! Trying to get a photo tomorrow. Thank you for your blog! I also read somewhere yesterday that Heavenly Bamboo is toxic to birds, cats and dogs? We have a huge one here and I'm wondering if I should rather remove it. Can you please tell us about that? Thank you for the appreciation, and for sharing your experience. I am not a plant expert, so cannot comment on the bamboo. I would contact Cooperative Extension Service for Los Angeles County. They would know the answer. I did a bit more research and yes, recent studies found out that the berries of the Heavenly Bamboo or Nandina is toxic to birds (and pets). Theodore Payne Foundation has a list of native plants to replace it with. Thank you! I have a huge phobia of all bugs. It started out with one of these hummingbird moths on my neighbors window which of course I have to pass as I come up the stairs to my house. Now there are three of them. I don't want to leave once I get in the house and I don't want to come home, because they are just there all the time. What can I do to get rid of them. I don't want them dead just away from the neighbors light and door. Please help! You might politely ask if the neighbor would turn off their outdoor lights at night (that is probably what is attracting the moths). If your phobia is seriously impeding what you consider a "normal" life, then I would also consider seeking treatment from a qualified psychologist. a white lined sphinx moth has been hanging around the porch light for days...i brought it in last night because it looked like it was freezing - friday & saturday are supposed to get below freezing here in denver & i won't be back until monday. can this moth survive below freezing & so i put it back outside? or if i leave it inside the whole weekend will it survive without nectar? it is just hanging on the wall for now. They can most certainly survive the weather here, or they would not be so common. Your caring and concern is much appreciated, but intervention is rarely necessary to insure the survival of an insect species. What should I do? What is the cause? I wish I had an answer for you. Reducing outdoor lighting at night might help, as the moths are attracted to lights at night. They also seek shelter at daybreak, but usually in tall grass rather than buildings. Lastly, it may be a different kind of moth causing you problems. There are many moths with this kind of color pattern. My goodness I sure opened the door to a vast amount of information when my husband and I saw this hummingbird thing that wasn't like our other hummingbirds that we've seen in Iowa. I think it must be this hummingbird moth. It had yellow & brown stripes on its' tail (sort of wide ones for the size of the tail, and no fuzzy rear part like I've seen on the other hummingbird moths, but the antennae were black and the needle~like protrusion they were sucking the nectar out with looked the same. I was interested to know that they are all over the United States. And that they are well able to take care of themselves in all kinds of weather even freezing. Thanks for all of the information, as this is very new to us. I was thinking about trying to catch it and show it to our Fish & Wildlife Son, Drew Schmidt, who graduated from Ames, Ia. about 34 or 35 years ago and works at Red Rock Reservoir, located outside of Monroe, Ia. Thanks so much for your information and your patience in answering all of our questions. You certainly make it very interesting. God bless you for sharing your expertise with all of us. Amen. You probably observed a different species, one of the moths in the genus Hemaris, judging by your description. Thank you for the compliments on my content here. Just saw one in our front yard in Frisco (Summit County) @ 9,000'. Thanks for your identification. I have one of these moths in my house right now. He is identical to the pictures of the white sphinx moth. He also eats flies, which hasn't been mentioned anywhere. He doesn't seem to mind posing for pictures either. I would put him outside but Is one want to risk Nottingham and he seems happened eating the flies. He has had two of them and is now resting.